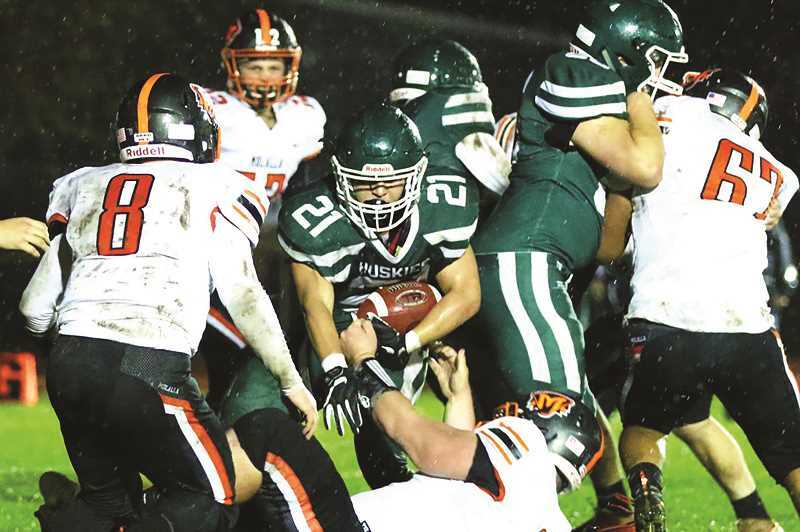 The North Marion football team used its punishing running attack to push itself to victory, defeating the Molalla Indians 12-6 in a home play-in game on Friday to punch its ticket to the state playoffs this week. For the second week in a row, the Huskies (5-4, 1-4 Special District 2) cashed a big check in the ground game, rolling up 265 of its 283 total yards between the tackles in their win over the Indians (2-7, 1-4 Special District 1). And once again it was senior Sam Garcia who did the majority of the damage, chewing up 159 yards on 31 carries, while scoring both of the Huskies' touchdowns to send North Marion to the state playoffs for the third time in the past four years. North Marion opened the scoring in the first quarter with a four-yard touchdown run by Garcia, and the Indians answered in the second period with a 10-yard score of their own. Both teams failed to convert on their ensuing two-point conversion attempts and the score remained tied at 6-6 heading into halftime. With the first heavy rainfall of the season coming down, both teams eschewed the passing game to double down on running the ball. But where the Huskies rose to the occasion, the Indians fell flat. North Marion held Molalla scoreless in the second half and neutralized their offense. Meanwhile, the Huskies kept moving the chains before ultimately scoring the game-deciding touchdown in the fourth quarter — another four-yard plunge from Garcia. North Marion's rushing game was bolstered by the return of senior Grant Henry from injury, adding 51 yards on six carries. The Huskies also saw positive contributions from Milo Bilyeu — seven carries for 34 yards — and Griffin Henry — nine carries for 25 yards. The Huskies will travel to No. 4 Marshfield (7-1, 4-0 Special District 4) at 7 p.m. Friday to face a Pirate team that boasts the second-best defense in the state, holding opponents to just 93 points on the season.